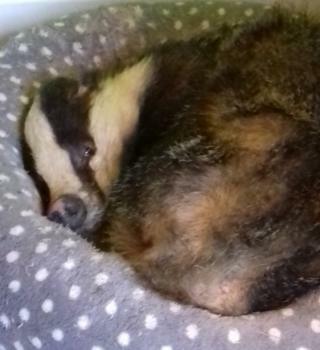 A sleepy badger was caught napping in a cat bed in a house in Linlithgow. The badger entered the kitchen through a cat flap and filled up on cat food before going to sleep in the soft bed. The Scottish SPCA was called to the house at Beecraigs Country Park on Wednesday and an officer was able to persuade the badger to leave of its own accord. The charity said it was unusual behaviour for badgers, which are usually shy animals, to enter a home. Animal rescue officer Connie O'Neil said: "I got a surprise when I arrived at the property and saw a badger having a nap. "He had gotten in through the cat flap and had eaten all the cat food before going for a sleep on the cat bed. "I don't think it realised it was going into a house - it just smelled the food and wanted somewhere to have a wee nap. "When I got there I pulled the badger's bed round so I could see him properly and he just looked at me. "It was then that the badger noticed the back door was open so made a run for it." Mike Flynn, chief superintendent at the Scottish SPCA, said: "It is highly unusual for a wild badger to enter a house and we would urge anyone to immediately contact our animal helpline on 03000 999 999 should they find one in an unusual place. "Like all wild animals badgers can be aggressive when injured or cornered so we would advise not to go near or touch them without giving us a call first."